For the rice: Combine the water, onion, garlic and salt in a blender and puree until smooth. Pour in the onion/garlic puree and add the whole chile. Bring to a boil, reduce heat and simmer for about 20 minutes until all the liquid is absorbed and the rice is cooked though. For the green sauce: In a large saucepan, put enough water to cover the bottom, approximately 1/4 cup, add the spinach and set over medium heat. Cover and let cook until the spinach is wilted, about 2-3 minutes, checking to make sure the spinach looks bright green. If it turns a deep green, it has cooked for too long. Put the spinach and water into a blender and add cilantro or basil, jalapeño and garlic cloves. Puree until smooth. When you are ready to serve the rice, pour the green sauce over the rice and mix thoroughly, so all grains are coated in the sauce. I always enjoy your show and feel excited as you showcase some of the beautiful cooking being done in Mexico. Then I saw this recipe and thought it is very exciting and smart, and I might not want to ever cook rice a different way! I have prepared this once and I discovered my family is a little overwhelmed by the very strong taste of raw garlic (such as the 3 cloves that go into the green sauce). I wonder if I should try roasting or saute the garlic before adding, or maybe you have some other hints on how to tame it for people who are sensitive to raw garlic taste. Go for it….or you can use just one or two cloves. We are a low carb family. I made the green “rice” with riced cauliflower. We usually find no difference in dishes where we substitute cauliflower for rice. I made your Carnitas and Salsa Verde as well for this meal. The rice came out wonderful, and we’ve been using it as a side for Mexican and Indian dishes. I can’t wait to try the tamales! Kymberli, have fun making the tamales as well…and I hope you enjoy them as much as the rice! I just watched thr show. I intend to make the rice next week. We’re trying to find new recipes to try. It looks delicious…can’t wait to try it. I really enjoyed watching. I felt like I was there!!! The tamales looked delicious!! I hope you enjoy the rice and many more new recipes, C.D.! I am making this right now, omg I already know it is going to be delicious! I’m totally intrigued with flavoring the water you cook the rice in! Seems like it would add soooo much flavor to it! Love your show! Loved the”Girlfriend” dinner! We all need to do that once in a while! Yes! Dinner with your girlfriends is always super fun. I hope you enjoy the rice! Pati, This rice was ridiculously good! Loved the spicy garlic flavor. I love patis recipes! Jus made this arroz with chicken soooo gooood….. You can make anything with this rice as a side dish can never go with out it. Love your recipes Pati. Much love…. Pati, do you soak/rinse this rice to prep if for this recipe? Same as your Orange Blossom Rice?… WHICH I LOVE ! (I’M SHOUTING)… so good. My family and I love your delicious recipes! Thank you so much for sharing and teaching my daughters how to prepare the delicious flavorful dishes from Mexico!! I also love how you take the viewers on a tour from different parts of the beautiful Mexico while you showed us the typical food from the region! loved San Miguel de Allende! Ivy, I so appreciate you tuning into the show! I am thrilled that your family likes my recipes. Thank you so much for trying them! ¿Cómo estás? Really like your program. I am looking for the recipe for a delicious dish called “Pollo Loco” which I had at a Mexican restaurant (‘Papas and Beer’) in Asheville, NC. Would you happen to know the recipe for this Mexican dish? I have not been able to find it. P.S. : The dish is #39 on page 5 below. Hola! Sounds yummy! I will try to post a recipe of this soon! Hi Pati, just wanted to know if you by chance know of a good posole recipe you can share. Is the taste of the rice mostly spinach, or mostly the herb (cilantro or basil)? I’ve been looking for a good cilantro rice recipe – this looks like it could be close, but not if the main flavor is spinach… ?? Its a combination… you can sub the spinach for other greens that you like, watercress? or more herbs? Came out great with Brown Rice. Used less water for the brown rice as well. Also seeded a jaiapeno for a milder taste, as I was afraid it would be too hot for my dinner guests. Will try with Serrano Chile next time…… Thank you. Can you use organic brown rice for this recipe or does it need to be definitely white rice? Very anxious to make this recipe. You can absolutely try it with brown rice! Go for it! My dad loves your show, and I sat down to watch the tamale party episode with him and we both fell in love with the recipes you made! 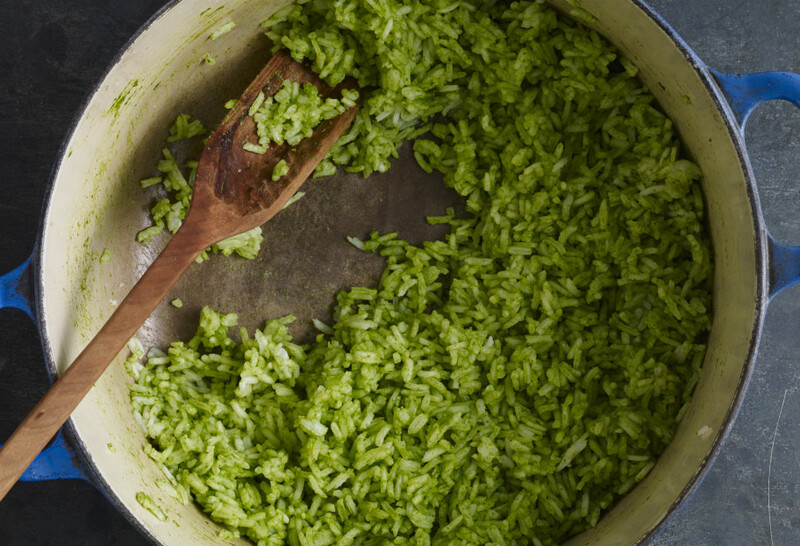 I just made this green rice tonight and it was such a hit that it’s already a weeknight staple. I’ve never had so much fun making rice before! Now I can’t wait to try your tamale pie and your other recipes. Go make this, world! It’s incredible! i just saw this episode today and while the tamales looked amazing, this green rice is the recipe that I WANT TO MAKE. que rico!! Thank you, Tim!! I hope you make the green rice.